Baby Milk Action wrote to the Chair of the Methodist Church Joint Advisory Committee on the Ethics in Investment (JACEI) on 6 August 2015 regarding the JACEI report on the Church’s £1 million investment in Nestlé. The JACEI report showed that engagement with Nestlé by JACEI and the Church’s Central Finance Board (CFB) led to Nestlé weakening its baby milk marketing policy. We felt this had not been made clear to people attending the Methodist Conference when the report was presented and the investment in Nestlé defended. We have received a response nearly a year later (dated 22 June 2016), shortly before this year’s Methodist Conference. We have replied as shown below (29 June 2016). As this information is of interest to the Methodist Conference, we are again making it an open letter. I am writing to acknowledge your letter of 22 June 2016, which has arrived nearly a year after we wrote to you regarding the JACEI report on Nestlé presented to the Methodist Conference in 2015. The JACEI report in 2015 showed that engaging with Nestlé and working for it to be listed in the FTSE4Good ethical investment index resulted in Nestlé weakening its baby milk marketing policy. We raised our concern that your presentation of the report to the Methodist Conference in 2015 had glossed over this fact, which was buried in the report (section 4.1) and unclear in the Appendix: Developments related to Nestlé since 2006. Nestlé revised its policy so it can advertise infant formula brands through promotion of breastmilk substitutes for older babies, something it promised not to do in the past. The Appendix said only that Nestlé had “revised” its policy prior to being listed in FTSE4Good, without clarifying this was for the worse. We felt this was unclear to Church members. 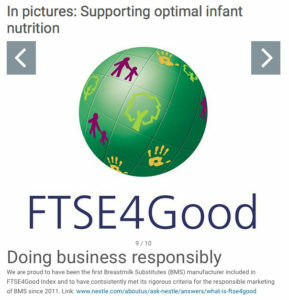 Using FTSE4Good accreditation as a measure of improvement has no validity as Nestlé only achieved accreditation because the criteria were weakened on the recommendation of the Breastmilk Substitutes (BMS) Committee. The Methodist Church Central Finance Board is a member of this Committee. It was the same Committee that recommended Nestlé be included in the listing, even after it weakened its advertising policy and evidence showed it systematically violating marketing rules. A self-evident conflict of interest arises when FTSE allows organisations with substantial investments in the sector, such as the Central Finance Board (holding £1 million in Nestlé shares), to recommend the criteria to be used for assessing companies and which companies to list. In our view, the CFB should either withdraw from the Committee or sell its shares. Objective assessment of marketing practices against the Code and Resolutions demonstrates Nestlé systematically violates these measures. The same is true of Danone, which we understand JACEI has also encouraged to join FTSE4Good and will shortly be included on the recommendation of the BMS Committee. As you know, Baby Milk Action and our partners in the International Baby Food Action Network (IBFAN) and others have called on FTSE4Good to bring its breastmilk substitutes criteria into line with the Code and Resolutions. We respectfully repeat our request that you stop suggesting the differences in interpretation exist only between IBFAN and the industry. Questions of interpretation are addressed in subsequent World Health Assembly Resolutions and where additional clarification is required, IBFAN seeks this from UNICEF’s legal department. It is the industry that is out of step with the interpretation of WHO, UNICEF, IBFAN and other experts on this issue. We appreciate that JACEI has commented in the past that it finds this “a complex and difficult issue” and note the confusion in your letter over the status of the Code and Resolutions with regard to marketing of follow-on milk. There is no dispute between WHO, UNICEF and IBFAN that all breastmilk substitutes come within the scope. WHO, UNICEF and IBFAN launched a joint report on the State of the Code in May this year prior to the World Health Assembly, and the Assembly reiterated that, “A breast-milk substitute should be understood to include any milks… that are specifically marketed for feeding infants and young children up to the age of 3 years”. In addition, the Code and Resolutions apply to all countries and companies should abide by their provisions independently of other measures (Article 11.3). However, you state in your letter that “The situation is not helped by the UK and EU legislation and guidelines that are explicitly permissive of marketing practices that the IBFAN network and others would consider to be in contravention”. Can we also draw your attention to the Concluding Observations of the UN Committee on the Rights of the Child in its assessment of the UK this year? The Committee responded to Baby Milk Action’s submission of evidence of violations in the UK by Nestlé, Danone and other companies by calling on the UK Government to fully implement the Code. If you are looking at the UK situation, please also bear in mind that Nestlé and Danone break the narrower UK measures and we have won cases against them for misleading advertising before the Advertising Standards Authority. The long-term changes in marketing practices that have been achieved have been due to the legislation documented in the joint WHO/UNICEF/IBFAN State of the Code Report and campaigns by IBFAN and others. As you are aware, Nestlé uses its FTSE4Good listing as its main tool to argue against regulation and to counter the boycott [left: Nestlé’s webpage dismissing criticisms of its marketing practices]. In JACEI’s own assessment, the only change you have achieved is to prompt Nestlé to weaken its advertising policies so it advertises infant formula brands in ways it promised not to do in the past. According to the Lancet Breastfeeding Series published in January this year, 823,000 under-5 lives could be saved every year by improved breastfeeding rates. Delayed legislation and formula promotion are quite simply contributing to unnecessary death and suffering. JACEI has commented in the past that it does not have the resources to discuss this issue “ad nauseum”. Accordingly, we ask you to listen to the experts referred to above. You state in your letter that you “commend the work that IBFAN does in monitoring and seeking to strengthen the implementation of the Code in national legislation”. IBFAN is telling you that our monitoring of the situation around the world shows Nestlé and Danone continue to systematically violate the Code and Resolutions and your impact in bringing them into FTSE4Good has only made things worse. JACEI’s mission is undoubtedly to make the world a better place and so we hope you – and the Methodist Conference – will give careful consideration to these facts.